Online job boards have become an important part of company’s employment strategy. It is cheap, easy and fast to advertise jobs online and the potential audience reach is extremely large. 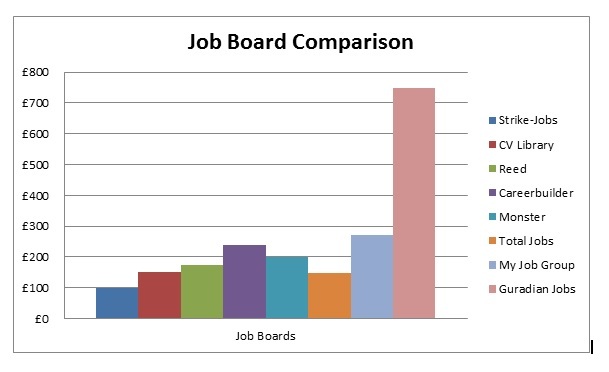 Job boards vary from large international websites to specialist job boards, but essentially they all offer the same thing. Online job boards are thriving so it can be difficult knowing which one can work for you. Strike Jobs has decided to take a look at its competitors and see how other job boards compare. Strike Jobs is an international job board, with over 15,000 jobs worldwide. Strike Jobs offers a one month free job postings trial for new clients. Free and easy job postings with no over complicated jargon. A friendly team help you set up your trial and will stay in contact over the trial period. Following this you will get the results from the trial month. Strike Jobs charges £100 a month after the trial month which includes unlimited job postings and full CV database access to over 170,000 live candidates in the UK. Strike Jobs is a rapidly expanding company. Strike Jobs can be contacted by phone on 02074934993 or email at info@strike-jobs.co.uk. Ask for your free 30 day job posting trial now. CV-Library is the UK’s leading job board, with over 100,000 live vacancies across the UK. CV-Library has over 7 million live CV’s from UK only candidates and receives over 2 million job applications monthly. In December 2013, four weeks of job listings with CV-Library had a start price of £150 and VAT. However, for more accurate figures contact them directly. Jobsite has been a business since 1995. Jobsite allows jobseekers to search for, save and apply for jobs online and through their mobile application. Jobsite has over 800,000 job applications monthly and over 3.8 million searchable CVs. Recruiters can advertise jobs, search for CV and create email campaigns once they create an account with Jobsite. Figures from December 2013 show that two weeks job listing costs £99 plus VAT. For more information contact Jobsite directly. Reed.co.uk was the first recruitment website in the UK and has grown to be the UK’s number one job site. Reed is a large company with 350 offices across the UK. They feature jobs from over 8,000 recruiters across the UK and the rest of the world. Over 3 million job seekers use the website every month. Reed offers different services for different prices. For example a premium account will advertise your job for six weeks and costs £175 plus VAT. For other offers and pricing they can be contacted directly. Careerbuilder was founded in 1995 and employs around 2,000 people worldwide. Careerbuilder works with over 300,000 employers in over 50 countries around the world. Careerbuilder allows employers to search CV and post jobs. The price for their services, as of December 2013, is £240 plus VAT per month. For more quotes contact Careerbuilder directly. Monster is a worldwide leader in successfully connecting people to job opportunities. Monster offers 20% off their job posting for new customers, with the discounted price of £159. The usual price is £199. This deal offers a job advertised for 30 days on Monster and other targeted websites. Totaljobs.com attracts around 6 million jobseekers to their site every month. Totaljobs.com has 110,000 live jobs advertised. Totaljobs.com is a UK company with seven offices throughout the country. They offer job advertisements and CV database access for customers. To advertise a job for 28 days with Totaljobs.com it costs £149. With this offer your jobs adverts are live for 28 days, you get applications in your inbox and you get to edit your advert whenever you want. For further offers and information contact them directly. MyJobGroup.co.uk is the fastest growing network of regional jobsites in the UK. MyJobGroup.co.uk has over 95 local jobsites across the UK. Employers and agencies can place adverts and are sent CV’s directly, have access to CV search and receive statistics. Figures from December 2013 show that four weeks job listing costs £270 plus VAT. For more accurate and up to date figures contact MyJobGroup.co.uk directly. Guardian jobs is the recruitment site of the Guardian News and Media group. Guardian jobs reaches over 1 million unique users. Guardian jobs have a range of products and prices. However, as of December 2013 four weeks of job listings cost £750 plus VAT. Fish4Jobs is run by Trinity Mirror and is part of the UK’s largest portfolio of specialist job sites. 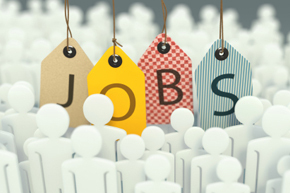 Fish4Jobs has over 14,000 jobs listed from over 1,300 employers. More than 65,000 new jobseekers use the website every month. Recruiters can advertise for seven days from £99. For other offers contact Fish4Jobs directly. Recruiters, the choice is yours. There are a wide range of services from online job boards, the decision is which one will you choose to advertise with? This entry was posted in General Posts and tagged board, compare, comparison, international, job, job board, job board comparison, national, strike, strike-jobs, top jobs. Bookmark the permalink. It is very important for a job board to discover its niche early in the game and capitalize on the same. In the long run if job boards continues to enhance this value, visitors will increase no matter what your posting rates are.